About a month ago I applied for an American tourist visa at the US embassy in Skopje because I plan on visiting my boyfriend there during fall break. Admittedly, I felt a little resentful of the process. Security guards with guns they weren’t going to use led us into the waiting room where everyone sat quietly until their numbers were called. Some of the applicants were going for vacations, some for their education, some for business purposes, and many to visit friends and family that had moved there. The near-silence echoed the kind of obedience that is primarily felt in places that have the authority to issue essential official documents. It felt like we were all on our best behaviour, not daring to make a sound that could be used against us by the US government officials who were about to determine the fate of our travel plans; like we were begging America itself to let us see the pretty sights that were presented to us on the promotional videos playing on the TV in the waiting room. Still, it wasn’t too scary or complicated a process. We were told immediately after our five-minute interviews conducted in the waiting room in front of everybody else that our visas had been approved and would be ready in one to four days. I picked up my passport on the same day I gave it to the embassy, now with a ten-year US visa pasted inside. To me this day was stressful only because I had a flight back to Berlin the next day, and if they had decided to give me my visa in two or four days, I would have had to rebook my flight. After I picked up my passport, relieved that everything had gone smoothly, my brother and I went to my grandparents’ house to see them once more before going back to Berlin. I told them all about my day and how I felt like part of the visa process was purposefully intimidating, but ultimately kind of fine. 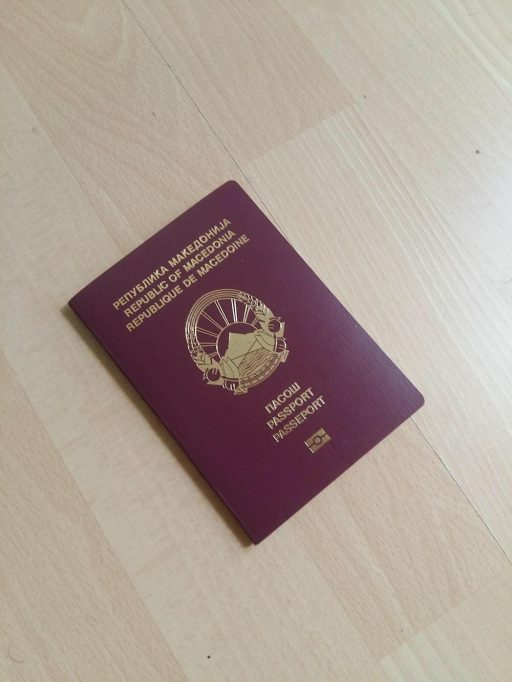 My grandpa found it surprising that I got my visa so quickly, noting that he didn’t remember it being so easy when Macedonia was a part of Yugoslavia. “It’s not like the government official decides after a five-minute interview that you get the visa. It’s basically been decided beforehand that you will get the visa. For whatever reason, they’ve decided that people from this country who apply for a visa will get it,” my brother commented, implying that the US government makes decisions about which countries get visas or get to immigrate to the US i.e. it’s not dependent on the individuals themselves, but on their country of origin. Those cries broke my heart. I kept listening to news about the separations of immigrant families at the US-Mexico border, unable to stop thinking about the difference in the dignity that was afforded to me as opposed to the five-year-olds who were treated as criminals. At the embassy, I had it easier than the people from my grandfather’s generation because, in the decades that passed, Slavs from the Balkan had become sufficiently “white”. We were no longer communists; our skin was pale enough; the number of educated people who wanted to leave our countries was increasing; we were a type of Christian; and we were eager to join Western military organizations such as NATO. After the 90s, we no longer seemed to be a threat, and could possibly be of benefit, so we were welcomed to go visit and maybe even immigrate to the US and Western Europe. Although Slavic immigrants are resented in certain countries like the UK, where they are often seen as bringing down the price of labor because they are willing to work for lower wages — something that’s obviously not their fault, but their employers’ exploitation of them — in the current political atmosphere I cannot imagine that Slavic children would end up in cages in the way that brown children from Mexico and Latin America have. When I flew back to Germany, where I am an immigrant, the police officer looked at my four-year residence permit and let me through as usual. Unlike other times, though, after I picked up my luggage, the customs officer asked me to show him my passport once again – something that has never happened to me before. He made me open my suitcase, asked me if I had cigarettes with me, and scolded me for the one package of white cheese that I had. As annoyed as I felt, a part of me wanted to believe that that truly was an ethnically-unmarked, random search. But another part of me – the part that was especially irritated about the cigarette question, which sounded like the stereotyping of Balkan people who smuggle cheap cigarettes into Western countries – felt like there was more to it, like a Western power such as Germany could quickly change their attitudes about which immigrants are dangerous or not, which immigrants are sufficiently “white” and which are not. Perhaps it is the fact that I am an immigrant – even one that is considered white – that news about the precarious existences of other immigrants always hits me very hard. Or maybe it is just the fact that there is no way to justify the caging of children or the drowning of refugees. So I did the only thing that I felt I could do to somehow help the injustices in both the US and Europe: I attended two demonstrations. 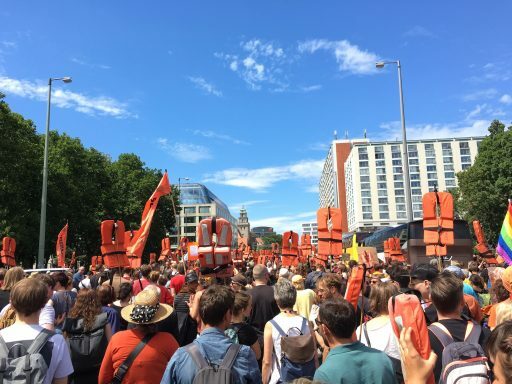 The first demonstration I went to was a “Families Belong Together” demo organized by The Coalition Berlin on the 30th of June. 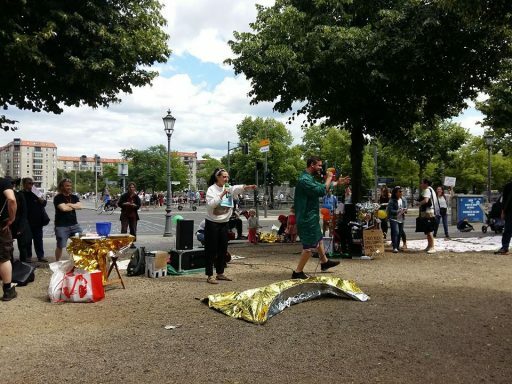 On the day that thousands of people gathered in many US cities such as New York, Washington DC, and Los Angeles to protest the Trump administration’s separation of immigrant families in detention centers, only 100-150 people showed up to our sister demo behind the US embassy in Berlin. Even with the understanding that it’s hard to mobilize people in the middle of the summer, I still felt disappointed by the number – I had hoped that at least a thousand people would show up in solidarity for an issue so important. And yet, there was something wonderful even about this small demonstration because there was a sense of community: I knew about fifteen of the attendees from previous demos. The only way that I can describe the feeling I get when seeing friends and acquaintances who share my values attend a protest on a cold June Saturday is the opposite of alienating. Two small children danced to fun, absurd rap by the Berlin band Die Tsootsies. 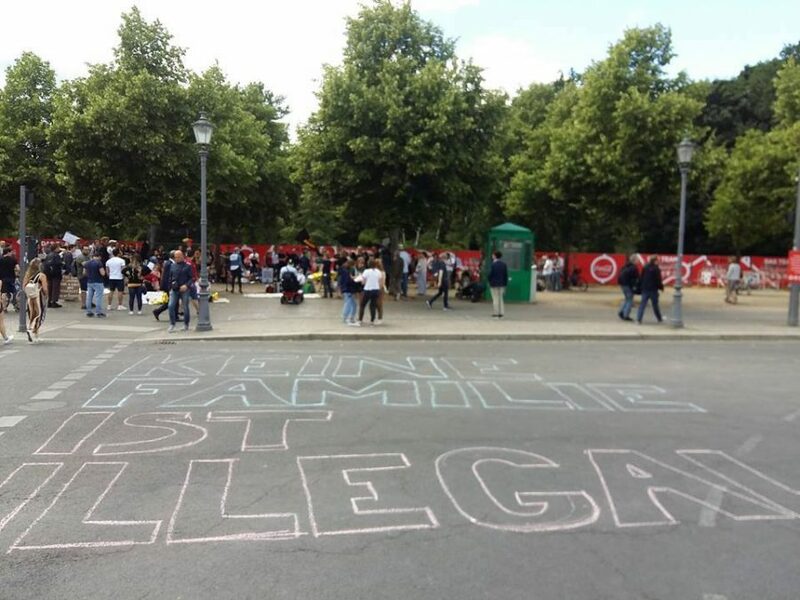 My boyfriend wrote out “Keine Familie Ist Illegal” in chalk near the US embassy. I had the megaphone and got to be chant leader. BCB’s Paul Festa came and read out poems that he used for his Poetry class because he felt that it is important to look to art in times like these. Musician Telma Savieto sang “We Shall Overcome”. Despite the size of the crowd, it was hard for me to not find it comforting at worst and inspiring at best. There was also an emphasis on history during the speeches at the demo. There was the constant reminder that these immigrants and refugees didn’t appear out of thin air: Many were a result of imperialist US foreign policies in Latin America, such as those toppling the democratically elected government in Honduras. In tune with the protests in the US, attendees were reminded that separating children from their parents is not new. Children of black slaves were routinely taken away from their parents and Native American children were often separated from their parents to be sent to boarding schools in order to assimilate into white America in yet another dark period of US history. I’ve always found Milk’s idea of the USes kind of beautiful because what he’s really calling for is solidarity. As hard as confronting the powers that be is, it’s always important to not only imagine what the end goal might be, but to recognize that it’s all really one fight at the end of the day. 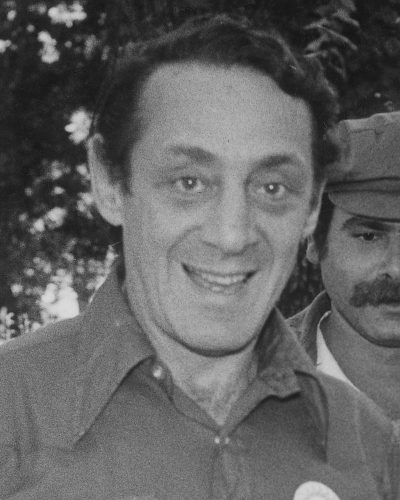 Harvey Milk essentially points out that, though different systemic oppressions like homophobia and racism do not necessarily function in the same way, they are not unrelated to each other. These oppressions all stem from what Milk calls “the THEMS” who hold power — be it economic or political or both — and who benefit from the marginalization of certain social groups. In today’s political landscape, racialized immigrants and refugees are certainly among the most vulnerable of the USes. In order to help those whose existences are under attack, it is up to the rest of the USes to stand up to the THEMS. At the demo the week after, Harvey Milk’s words echoed through my head as I marched with thousands of the USes standing up to new deadly migration policies. And yes, I did feel that this march was important for me and its participants too. It seems like immigration is the issue of our generation and a fight that big is not easily won. It requires the determination and continuous participation of a large number of people. When making demands as a group rather than as individuals who, in general, do not have a high degree of agency, entities of power are put under greater pressure to meet those demands. It’s monumentally important for people to not feel like there is no hope for change. So we ought to savour these moments of solidarisch joy to keep us going. To quote a character from Pride (2014) “When you’re in a battle against an enemy so much bigger, so much stronger than you, to find out you had a friend you never knew existed, well, that’s the best feeling in the world.” And perhaps the nurturing of these feelings of joy — feelings built on a foundation of political outrage and elicited by coming together — will eventually make the moral arc of history bend towards justice.